At A Healthier Michigan, we decided it would be fun to feature healthy recipes from our favorite restaurants around Michigan and this week’s recipe comes from a restaurant in the heart of Detroit. 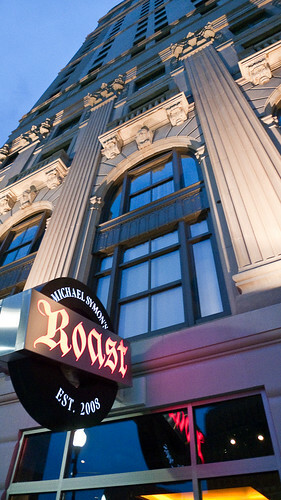 Michael Symon, an award winning chef, opened Roast in Downtown Detroit at the Westin Book Cadillac in Fall of 2008. Since then the Detroit Free Press named it “Restaurant of the Year” in 2009 and has had many other rave reviews. Put the garlic and a pinch of salt in a large mixing bowl. Add the vinegar and slowly whisk in the oil. Add the carrots and beets, onion, cucumber, feta, dill, and mint. Gently toss. Add salt and pepper, to taste. Transfer to a large platter and serve immediately. If you try this recipe at home share your photos with us on Facebook or Twitter.